Wi-Fi is, to my mind, the single biggest revolution in computing of the last ten years. I use it everyday, and it's changed my life in more ways than I can count. But it's hardly perfect. Its range, for one thing, sometimes leaves a little something to be desired. Fact is, that depends as much on your computer's wireless adapter as anything else. Buffalo's AirStation WLI-U2-SG54HP (Japanese link) may have a name only a mother could love, but its goals are lofty. It intends to raise the wireless range on your computer to 170 meters (that's over 550 feet for us Yanks). 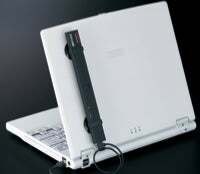 Just plug it into your computer's USB port and suction the giant antenna onto the back of your laptop , and you're good to go. Okay, so portability may not be a watchword on this sucker, but if you need the range, well, you need the range. It's coming to Japan first, for a price of about $39, but there's no word yet on American ship date, or whether it will be compatible with my MacBook. Which gets pretty good wireless reception, so perhaps I can avoid the eyesore.